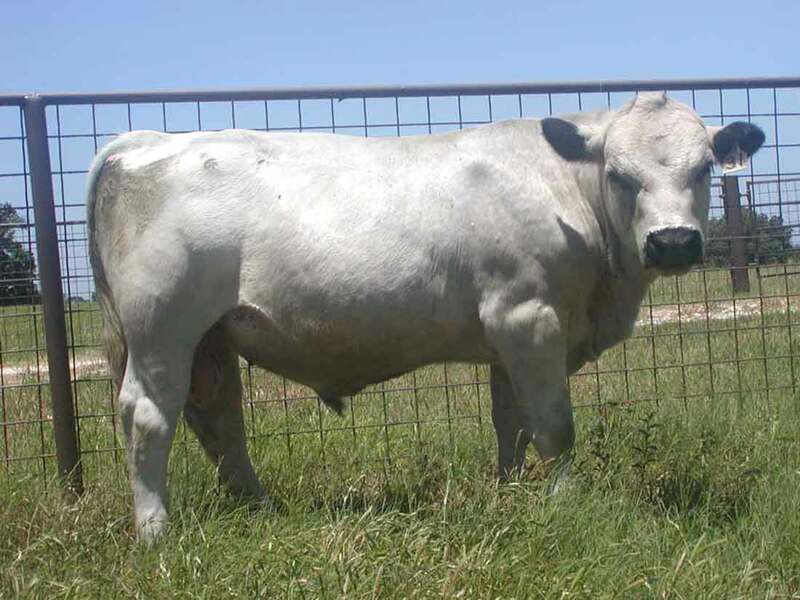 UPDATE 5/5/11: Doughboy is now offered for sale due to unforeseen circumstances, please visit the bull sale page for current information on Doughboy. He is a fine herd bull looking for new pastures. 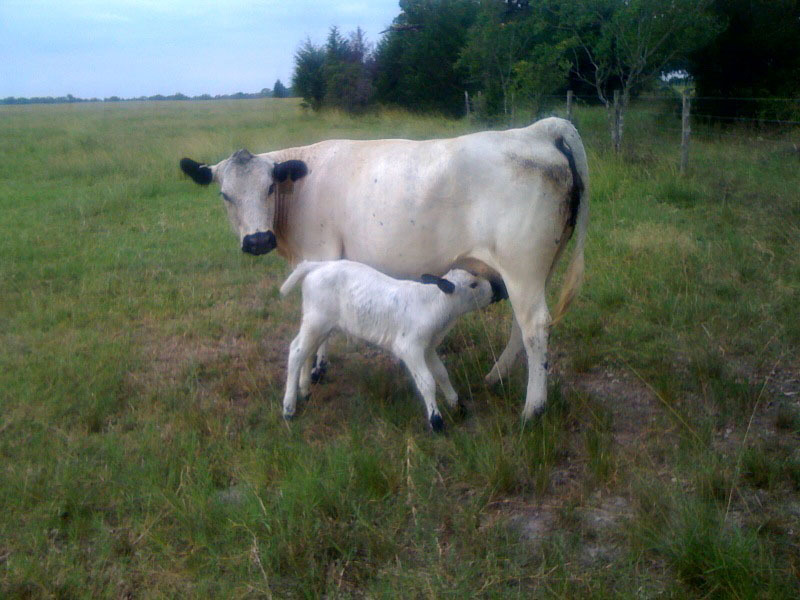 It has been much too long since I've written a blog, and have decided to get back in the swing of things with the following photos sent to me from Patrick and Valerie Dietz-Klein, British White breeders in Carmine, Texas. Just over a year ago, in September of 2009, they purchased J.West's Doughboy, an El Presidente son like none other, born April 2007. The Dietz-Klein's are pursuing a grass fed cattle operation with the goal of direct selling grass feed beef. Doughboy seems a very nice fit for accomplishing that goal, packing a lot of meat on a very feed efficient frame as well as genetics. 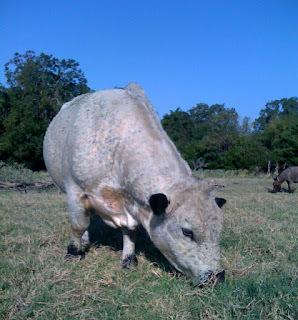 He is pictured here at pasture, and I was truly amazed to see the incredible growth of Doughboy. This photo is from July 2010, so he is just over 3 years old and is now about completed his frame growth, though I expect over the next two years they will see him get even thicker and more muscular. He has very good length of body and you can see the musculature of his sire very evident. From the moment he was born and throughout his growing months, he stayed fat and rounded and muscular, hence his naming of Doughboy. Doughboy's dam is J.West's Elsie Edna, a Huck Finn daughter, and one of the two best Huck Finn daughters I've ever raised. This photo is of Doughboy in May 2008 at 12 months old, looking very well and definitely showing his potential for a herd sire that will pack lots of easy-keeping muscle - but clearly on a quite moderate frame. ﻿ The Dietz-Klein's had their first calf born this past July, it seems Doughboy went right to work on his new job as herd sire, and clearly had no difficulty breeding cows a couple frame scores taller than himself. 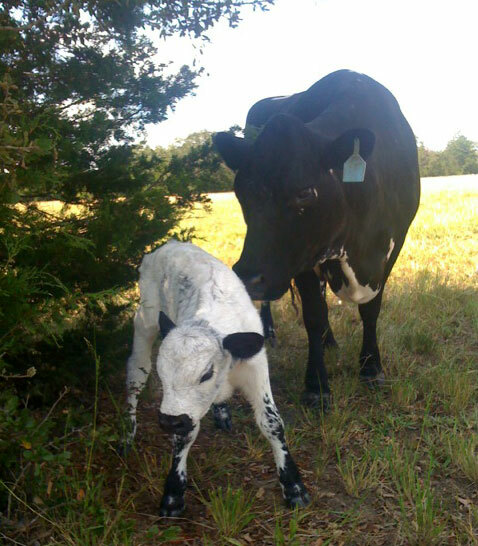 The young calf pictured here at left above is presented with great British White color on his black Maine Anjou/Angus cross dam, so kudos to Doughboy for throwing good color. And the next photo is a one day old Doughboy calf from J.West's Adrianna (a daughter of King Cole), and what a pretty picture that is. So far it looks like Doughboy is going to throw nice color and very moderate birthweights. 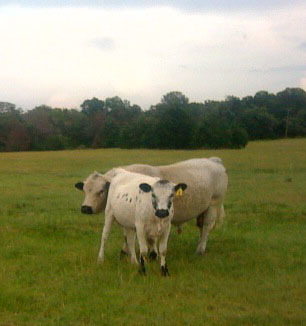 It is now October, and Doughboy has put ten calves on the ground, including their first "grandbaby", so check for more photos and additional information on these new additions to the Dietz-Klein herd of British White cattle. Update: This last photo is J.West's Bountiful 04, an overmarked American Fullblood British White cow, sired by DFTX 'Doc' Watson, and whose dam, HRH Bountiful, is still a working cow in my herd. Here she has a brand new Doughboy sired bull calf at foot, and clearly Doughboy is throwing very nice standard color on both commercial black females and overmarked British White females, such as Bountiful. See updated photos of this calf in my March 3, 2011 blog post.